The P7 drive is the choice for industrial variable torque applications such as centrifugal fans and pumps. The drive has normal duty ratings with nominal 110% for 60 seconds overload capability. Network communication options and an array of input/output devices are available for installation flexibility.The P7 drive is available with optional bypass control and other fan/pump options. 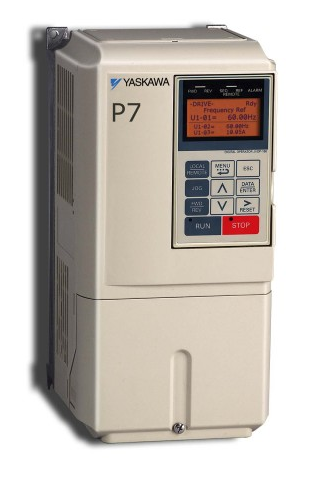 Applications: The P7 is designed for variable torque applications like Fans and Centrifugal Pumps. Features: It is supplied with V/f control and Normal Duty overload rating of 110% for one minute. Network communications, plug-in I/O cards, and power/packaging options are available. With an optional phase-shifting input transformer, the P7 dual-diode bridge can be operated in 12-pulse rectification mode, reducing input current harmonic distortion.